A significant construction milestone was reached at the Tupelo Bayou Wastewater Treatment Plant in Conway, Ark. when a 500-ton crane lifted a section of the spiral-floating dome and placed it into the secondary digester tank. 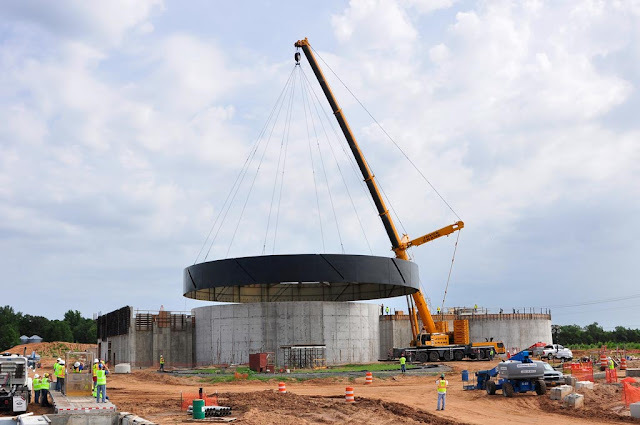 The placed section of dome weighs approximately 125,000 pounds and slipped into the 100-foot diameter concrete tank with 4.5-inches of clearance. The project, which began last year, is scheduled for completion in 2014. 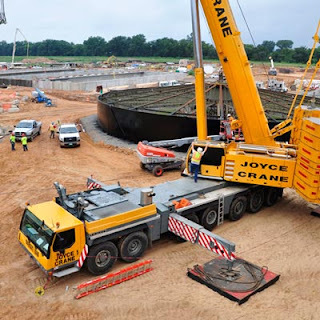 Garver designed and managed construction at the WWTP at Tupelo Bayou, which will process an average flow of 16 million gallons per day and utilize a conventional activated sludge process to achieve the plant's discharge limits. The WWTP at Tupelo Bayou will replace the existing Stone Dam Treatment Plant and serve the rapidly expanding central Arkansas metropolitan area for many years.